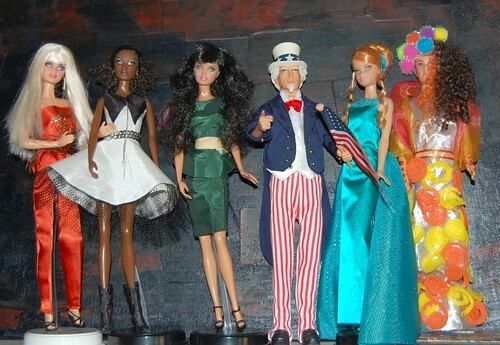 Apparently a few Mattel Top Models were concerned to hear that the High Priestess of Plastic, Mattel Top Model Barbie herself, was looking for them backstage at Fashion Week. No worries. She's joining Tyra Banks, creator and executive producer of America's Next Top Model, to promote the web site declareyourself.com. On Declare Yourself, you can find your state's guidelines for early voting; how, when, and where (including online deadlines) you can register to vote; and information about issues. ONLY YOU CAN SILENCE YOURSELF! Thank you, Lynne, for Uncle Sam.